Harbour Mill is a mixed-use development comprising the restoration of the former Edwin Davey & Sons Flour Mill with residential apartments and commercial floor space. Slated for completion in 2015, the project has a gross realisation of $100 million. Built in 1896, the Edwin Davey & Sons Flour Mill was one of Sydney's longest serving ﬂour mills. In 1911 the mill underwent a no-expense-spared rebuild after ﬁre destroyed much of the building. The mill continued ﬂour production until its closure in 1996, after nearly 100 years of operation. Today, the site remains historically significant and its remaining walls stand as one of the last vestiges of an industry once prevalent in the area. Designed by Grimshaw Architects, the mixed-use development is a composition of two complementary buildings – a four-storey structure which sits within the existing heritage facade and a 10-storey structure which steps up and over the smaller element. The two interlocked buildings in Harbour Mill comprise 32 studio apartments ranging in size between 40 and 69 square metres, with prices starting from $395,000. 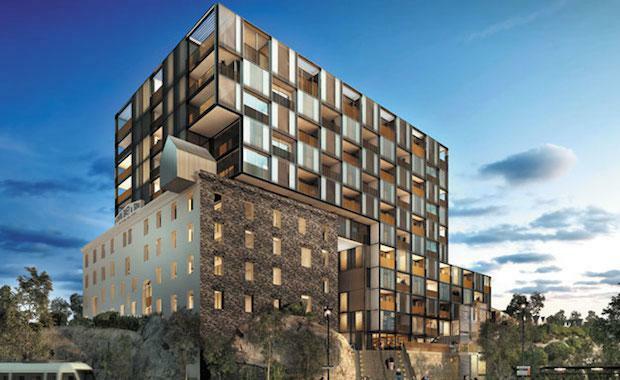 The 51 one-bedroom apartments will range from 55 to 75 square metres. There will be 45 two-bedroom apartments, ranging from 80 to 98 square metres. The eight largest apartments, of three bedrooms each, will range from 100 square metres to 122 square metres and will come with extensive roof terraces. They are inter-linked by a series of voids and setbacks which help to deﬁne the overall composition. Harbour Mill also features ground ﬂoor retail space, a communal gym and numerous opportunities for outdoor recreation. Located in the Sydney suburb of Pyrmont, the site adjoins the Wentworth Park Light Rail Station, which is linked via public domain improvements planned to encourage access by residents and the broader community. Pyrmont's transformation over recent years has seen it emerge as a wonderfully vibrant, cosmopolitan inner city address full of colour and diversity.